[M]y unscientific observation was that the general quality of applications was up; the 52 entries that made it to the first cut seemed particularly strong and drew on what felt like a broader base of applicants than previous rounds had. This year’s crop proposes fairly obvious ideas. It’s surprising that some of these haven’t been built already. Why does the Knight Foundation have to fund something as basic as a browsable map for live videos? There’s one clear answer: News organizations — for whatever reason — haven’t built them themselves. Behavio is an open-source platform that turns phones into smart sensors of people’s real world behavior, from how they use their phones to how they communicate with others. Funding will be used to help programmers build apps with smarter sensors, create tools for journalists that uncover trends in community data and launch a mobile application that allows individuals to explore data about their lives. Interestingly, Signalnoi.se aims to do what could be considered another nail in the coffin of any print newspaper that had experienced staff cutbacks and had more of less ended up going digital, as was the case most recently with The Times-Picayune in New Orleans. Co-founded by Mohamed Nanabhay, former head of new media at Al Jazeera, and Haroon Meer, the startup provides editorial analytics to see what topics and headlines resonate with readers the most, identifying trends and surges of interest. With newsrooms stretched for resources, editors have to increasingly make difficult decisions about which stories get covered and promoted. Signalnoi.se aims to help, by tracking social engagement with the news — scanning social network activity to provide real-time information on what’s resonating with readers. Editors are able to track their own — and competitors’ — stories. The kit will include The Tor Project’s secure Web browser and anonymous upload utility, along with new tools and training videos. Other potential users include activists, the law enforcement and the military, businesses in search of confidentiality and those that need to research competition or conduct an internal investigation; and anyone who wants to shield himself or herself from traffic analysis or wants some family privacy online. Two of the winners, the Knight Foundation notes, Signalnoi.se and Watchup, are receiving funding through the Knight Enterprise Fund, an early-stage venture fund that invests in for-profit ventures. 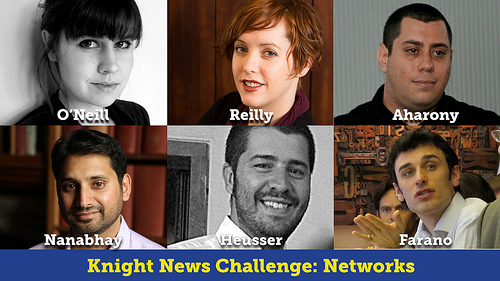 The second round of the 2012 Knight News Challenge, on data, is accepting applications through June 21. The topic of the third will be announced later this year, the organization says. Image by the Knight Foundation, used under Fair Use: Reporting.